I wonder what they’ll say when people start walking around with frying pans. We don’t need to mention that it’s just in case we might need to clock somebody with it. There are these things called “grinding wheels”. 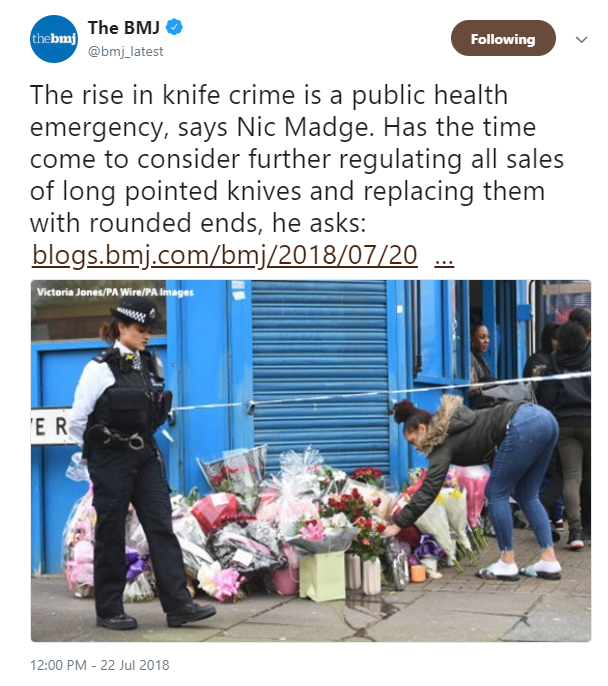 Perhaps, the police could organise programmes whereby owners of kitchen knives, which have been lawfully bought for culinary purposes, could be modified, with the points being ground down into rounded ends. Apparently he doesn’t realize that a blade that can be ground to a round point can be re-ground to a sharp point. Somehow the saying “he isn’t the sharpest knife in the drawer” is appropriate here. Wait till they find out how many people are beaten to death with bare hands…. Seriously, I have lived in rural areas in the US and almost every adult man had a knife either on his belt or pocket. It is a necessary tool, and in fact in the form of stone axes a sharp edge is the oldest tool we have record of in human history.